Rachel wanted me to paint her a picture of purple wildflowers. She sent me a bunch of photos from the Internet with pictures she liked, and we discussed what she liked about them. Then, I made a few very quick sketches of this in my sketchbook before painting. From that initial discussion I gathered that she wanted the color purple to shine, without being overpowering. She also thought landscapes at sunset with large fields of purple seemed cheesy. She liked several pictures that were closeups of individual flowers, but she wanted more than just one, without it looking like a bouquet. I imagined someone sitting in a field of purple flowers, and painted that. She really liked these bulbous flowers, so I made them the predominant kind. I tried to keep a Fibonacci spiral in mind when I made the composition, and sketched out a rough golden rectangle using a drafting compass and a ruler to see where the tallest bulbous flower should end up. Then, I imagined the grasses and stems being bent, creating a natural dip in the spiral, with some purple blue bell-type flowers making the other side of the spiral for some contrasting texture. After sketching, I masked off some areas, and then started painting. 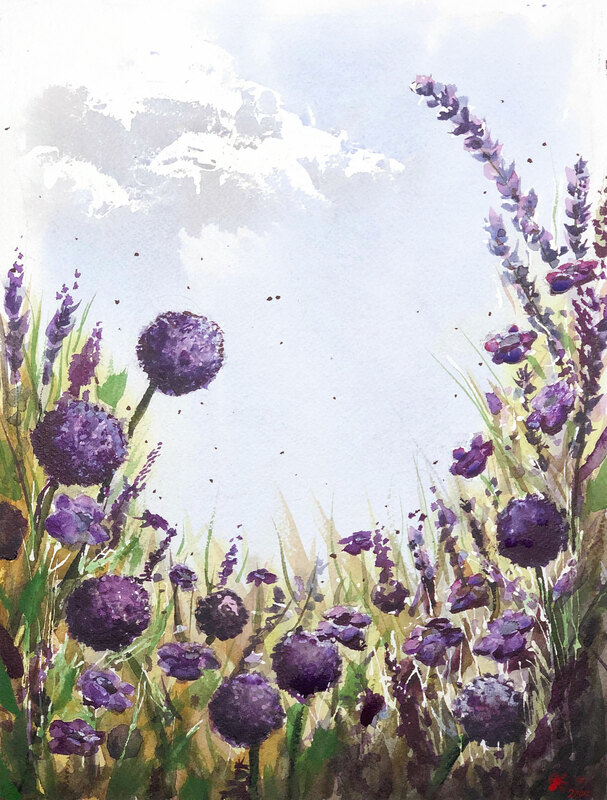 In the sky, I applied masking fluid where I wanted the cloud to be, and spread it loosely with a blending tool. Then, I got the paper wet, and roughly applied some cobalt blue for the sky. After that was down, I mixed Phthalo Blue and Burnt Sienna to get a cool grey, and added shadows under the clouds, and let that run a bit. Then, I lifted a bit with a rag, and let the sky dry. With that dried, I applied some quin purple to the lower left corner to establish a dark corner to contrast the cloud, and painted some serpentine green and quin gold as a light wash where the grasses would go. After that, I loosely dabbed in some Amethyst Genuine for the flowers, and dropped in Quin Purple, and Lapis Lazuli Genuine for added interest on the petals. Once that dried, I added some blades of grass in Sap Green and Undersea Green. I thought more about sitting in a field and realized the painting would need some little flying insects to make the composition more alive, and provide a story as well as a sense of scale. I dabbed in some tiny dots of Bloodstone Genuine to give the impression of some spring insects flying around. When that was done, I tinted some of the quin purple with Chinese white and added that as a watery mix in a few places before finishing up with some straight quin purple on the flowers. I think the Fibonacci Spiral is a bit too defined, and I used too much quin gold in the grass. The Amethyst Genuine is incredibly sparkly, which you can’t see in the photo. It shimmered so much that I ended up using some more Quin Purple to try to tone that down. Now, I kind of wish I hadn’t. That Amethyst is really very pretty, and goes all the way from an opaque near black to nearly rose. I wish I had lightened the grasses with more green, and if I do it again I’ll probably change how I did the flowers. Instead of painting them all in roughly the same way but with different areas of light, I think I would like to try to use rich Amethyst in the shadows, and more Quin Purple/Quin Rose in the lighter areas. So, there it is. A painting for my bride.